If the picture doesn’t impress you, here’s a video. The video still doesn’t do the scene justice. There were so many birds, but they don’t show up well in wide-angle photos. 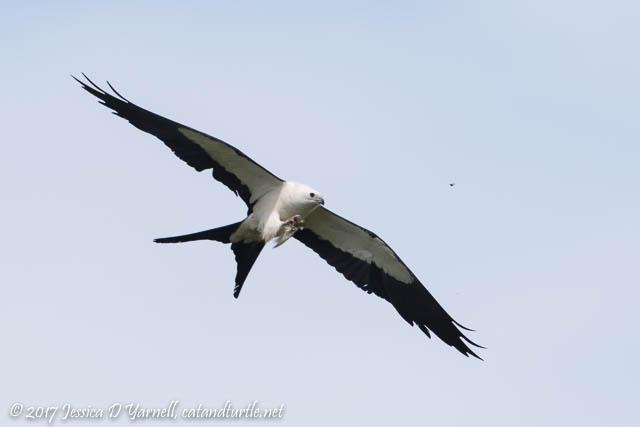 Kites are pretty smart birds. They could flap their wings to fly, but that uses energy. 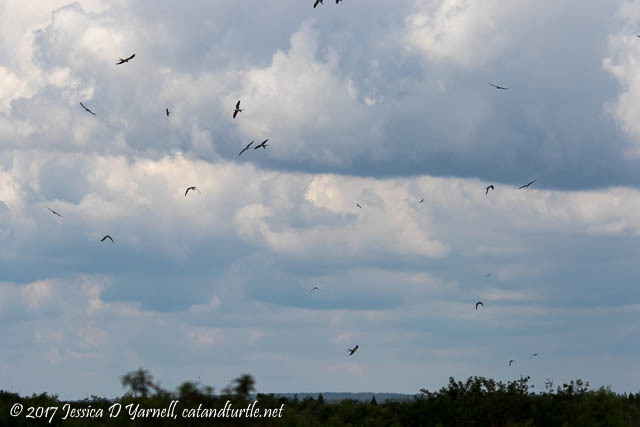 Instead, they ride the wind thermals, flying in circles in what is called a “kettle.” It’s fun to watch, especially when there are large numbers of birds. 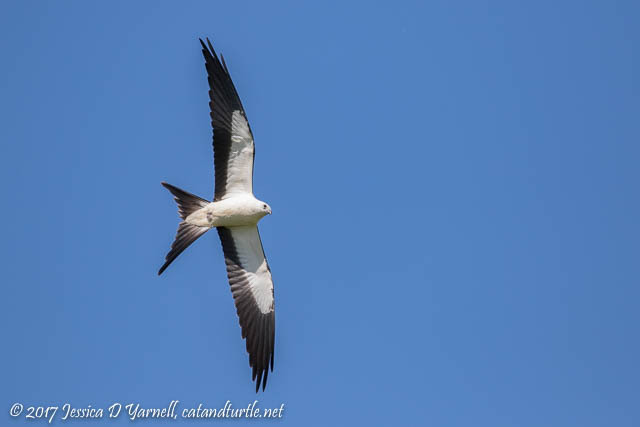 The maneuverability of the kites is pretty incredible. 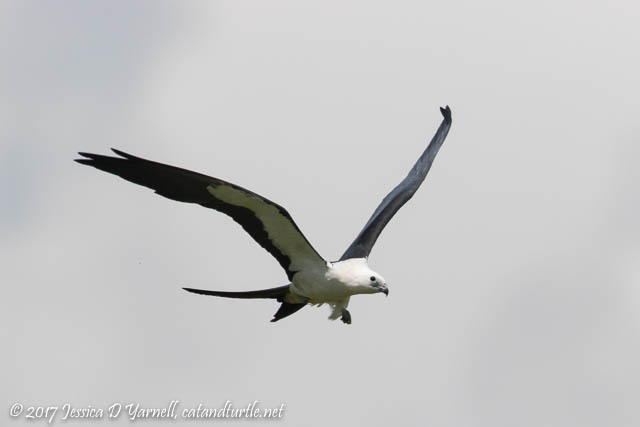 They use their tails to steer, and it’s amazing to watch them suddenly dive in mid-air. But these birds weren’t just flying in circles to put on a photography show. No, it was lunchtime, and they were feasting. On what? You would guess that raptors with talons as big as those would grab a decent-sized meal…but no, they were grabbing insects in mid-air. 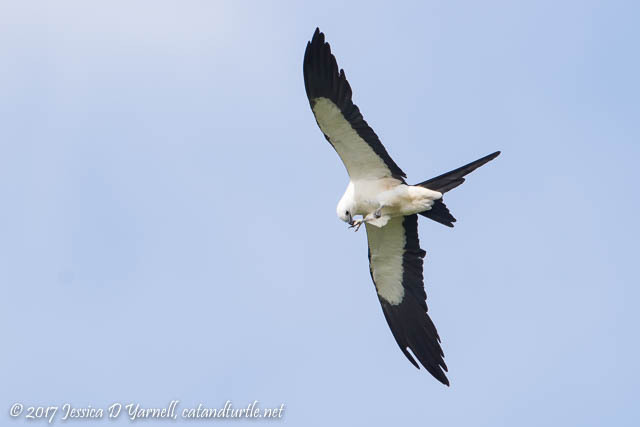 …and then eats it in mid-air! This process happened repeatedly. At first I was excited to capture a bug-catch. Then I realized that almost all my shots were bug shots, whether the bird was catching the bug, flying with the bug in its talons, or eating the bug. It takes a lot of bugs to fill a kite stomach! 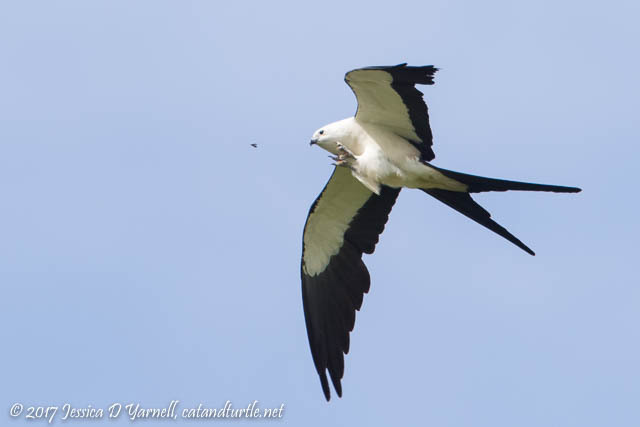 Swallow-tailed Kite with Bug in his Mouth…Don’t Chew with your Mouth Open! 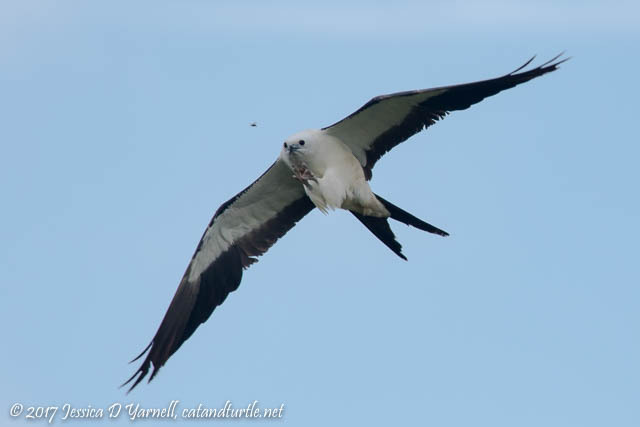 I love the shots with the kite approaching the bug with talons outstretched. I’m surprised they don’t just catch the bugs in their mouths. Instead they grab it, hold it for a few seconds, then reach down to taste it. 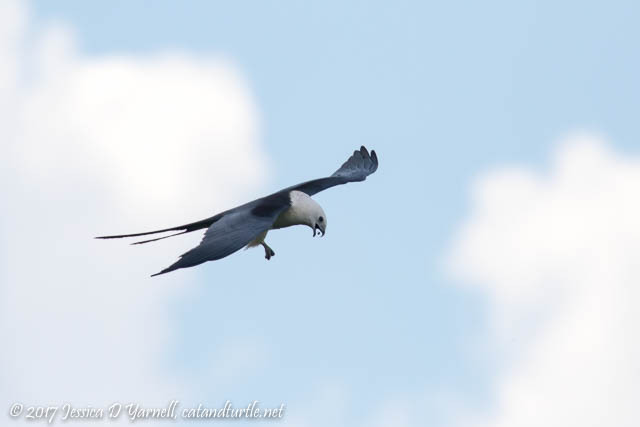 Sometimes you see little bits falling through the air as the kite drops…the leftovers? Or this bird was showing off his bug-tossing skills as he grabbed the bug in mid-flight! 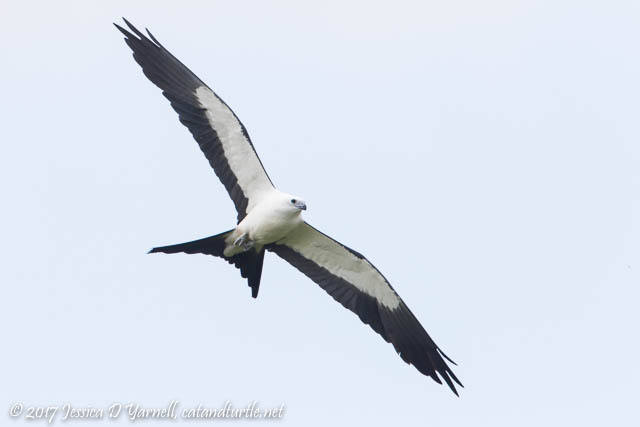 If you want to read more about these beautiful birds, visit the Swallow-tailed Kite Migration blog. 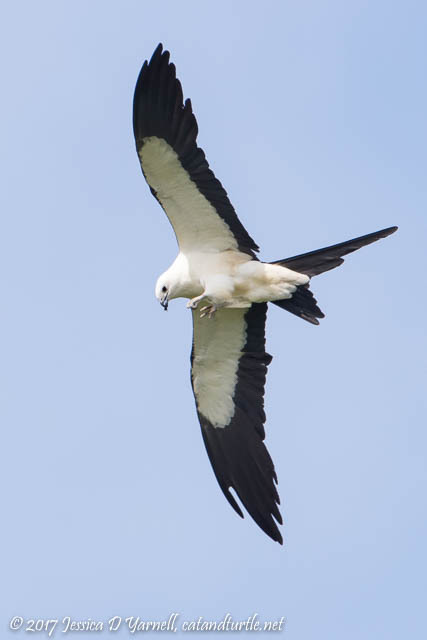 Their team tracks some radio-tagged birds during the annual migration. It’s fascinating to read. 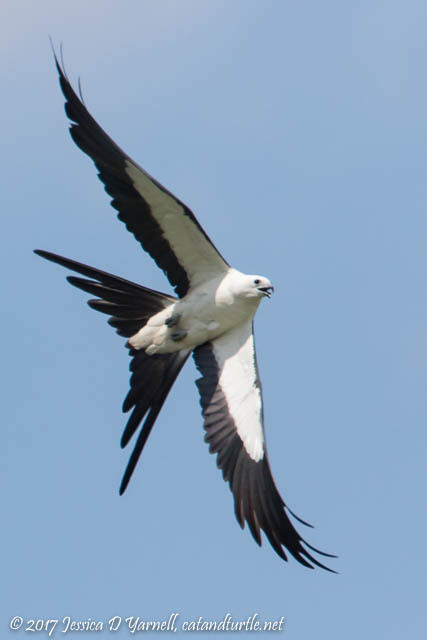 The kites have been tagged in different locations around the Southeast US, and several of them migrate to virtually the same spot in Brazil. Then when it’s time to come back to Florida, they leave at slightly different times and follow slightly different routes. 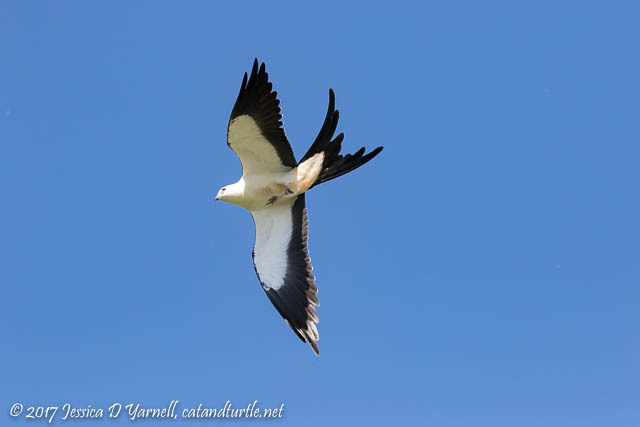 This year, one kite (MIA) ended up getting caught in the winds. What should have been an easy flight from Cuba to Miami took a major detour to Louisiana! 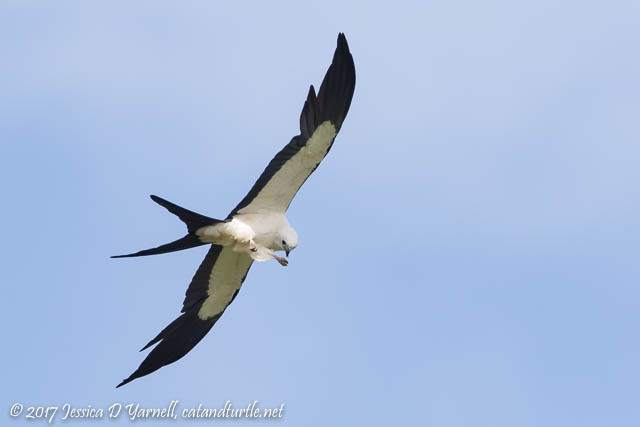 Definitely follow the Swallow-tailed Kite blog if you want to track the southbound progress of these birds this summer/fall.